The weak spot on the Hetzer's sloping frontal armour was the driver's vision port. It was a shot trap. Whereas most Allied shells hitting the angled armour at the front of this tank destroyer would bounce off, they would penetrate into the crew compartment if they hit precisely this location on the protective armour plate. After a few Hetzer's were destroyed because of this design flaw the German crews started to paint black long thin rectangles onto the armour plate camouflage. The idea of this was to fool the enemy into thinking that these black lines were the driver's vision slits. They were painted on the strong parts of the frontal armour on the right-hand side of the main gun as you look at the front of the tank. Enemy shells hitting these areas would not penetrate the armour. 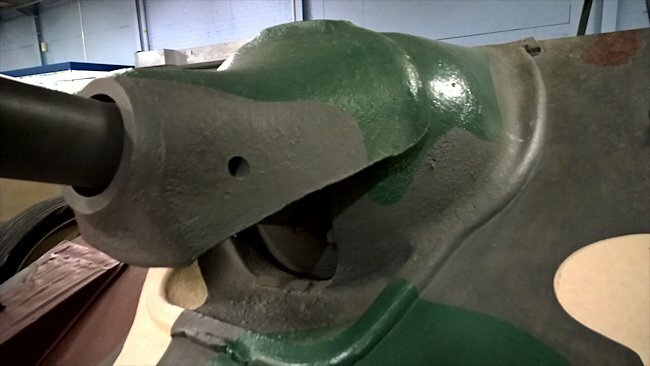 If you have a look at the restored Hetzer, that came off the production line in January 1945, now on display at the Australian Armour and Artillery Museum in Cairns, Australia, you will see some of these black lines painted on top of the camouflage on the sloping front section of the Hetzer's armour plating. Early model Hetzer's built in 1944 can be identified by having a large exhaust silencer secured horizontally on the top of the rear armour plate. Hetzer's built in 1945 had smaller exhausts and no large silencer box. The driver's vision port is enclosed in a moulded triangular armoured cover. Later versions of the Hetzer just had a sheet metal covering for the top and sides. Late-model Hetzer's 75 millimetre gun was fitted with a stronger more curved Saukopfblende (usually translated as pig's head) gun mantle. The sides gave added protection as they float over the vulnerable part in the front hull where the bottom of the gun juts out of the armour plating unlike the earlier version. 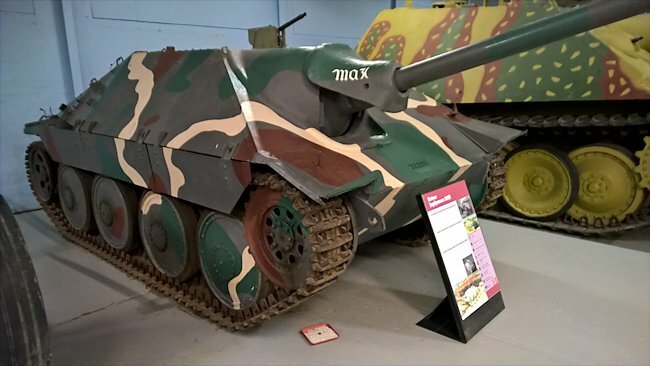 Officially the German army never used the word Hetzer (baiter) in any military documents when mentioning the Jagdpanzer 38(t) light tank destroyer. It was a nickname given to the vehicle by the troops. Following the early encounters with the Russian T 34/76 and KV-1 tanks the German army recognised that they needed the ability to have large high-calibre anti-tank guns fixed to an armoured vehicle. The Panther and Tiger tanks were under development and construction. An interim solution had to be found. Right hand side view of a Hetzer Tank Destroyer. Notice the late model small exhaust. The Germans had captured a number of enemy tanks and anti-tank guns. 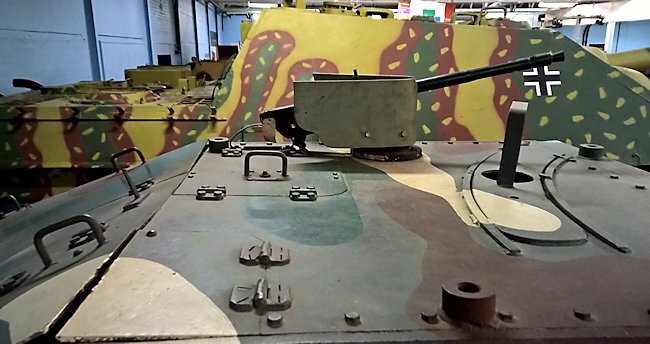 The engineers decided to remove the original turrets and guns on these tanks and replace them with larger anti-tank guns fitted on top of the tank chassis. These early self-propelled guns were given the name Marder. There were lots of different variations produced but a common feature was that the fighting compartment was open to the elements and only had thin armour plating around the side of the gun, nothing covering the top of the gun. This meant that the crew are susceptible to injury from high explosives shrapnel, grenades and Molotov cocktails. The Hetzer was a response to this design fault. The crew compartment was completely covered with much stronger armour plating that was angled to help deflect incoming enemy shells. They were produced in the Skoda factory in German occupied Czechoslovakia between March 1944 and May 1945. After the war Skoda continued to make an upgraded version of the Hetzer called the G-13 for the Swiss army. 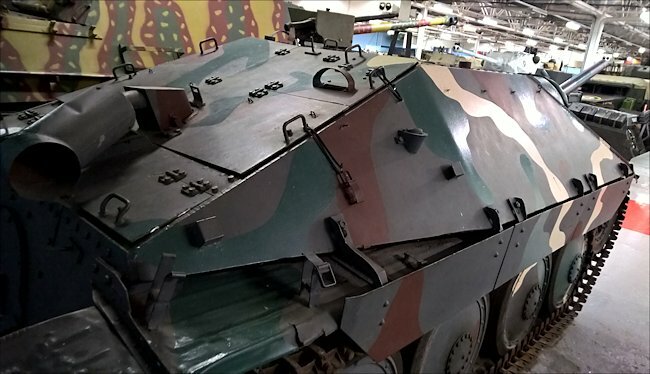 Many of the Hetzer that are on display in military museums are these post-war G13 Jagdpanzer tank destroyers. 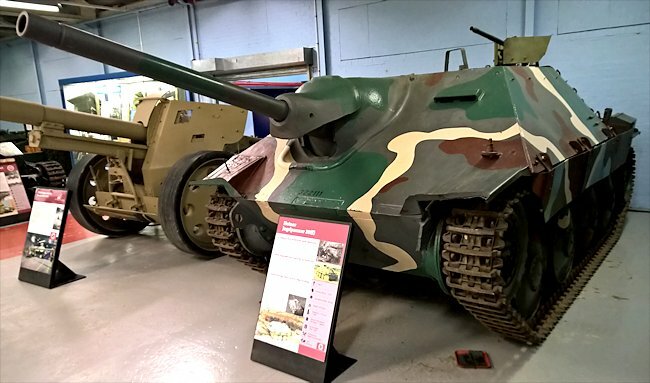 The World War II Hetzer's were fitted with a powerful 75 millimetre Pak 39 L/48 anti-tank gun that was capable of penetrating all of the Allies armoured vehicles on D-Day. Each vehicle officially could hold 41 rounds but German crews would cover the floor with extra rounds. They would literally be standing on shells and shell casings. 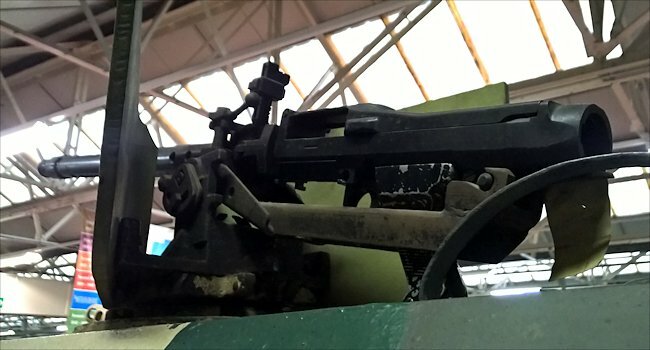 A 7.92 millimetre machine gun was fitted to the roof of the tank destroyer. It was based on a widened and lengthened chassis of the pre-war Czechoslovakian Panzer 38(t) tank. Although the front plate armour was only 60 millimetres thick it was sloped at 60 degrees from the vertical. This meant it had the equivalent protection of 120 millimetres of armour, which is more than the front armour of a Tiger tank, but without the weight. The 20 millimetre side armour was also angled but only had a slope of 15 degrees. The Hetzer tank destroyer was powered by a Praga six cylinder 7.8 litre petrol engine which gave a top road speed of 42 kilometres per hour (26 mph). The Hetzer tank destroyer proved to be a reliable and very potent tank destroyer for its size. More importantly it was a lot cheaper and easier to produce than its bigger cousins like the Jagdpanther and Jagdtiger heavy tank destroyers. Just over 2800 were produced.